We developed the R core cutting machine based on the U core cutting machine. 0.23mm, 0.27mm, 0.30mm Hi-B oriented silicon steel strip will be adopted to make sure the best magnetic performance. 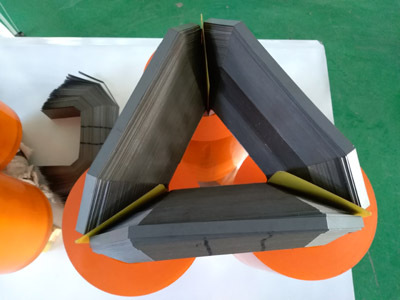 the magnetic core is made by a continuous silicon steel strip, no break point. The flux path is continuous, no gap and less flux leakage, which guaranteed the high magnetic performance. 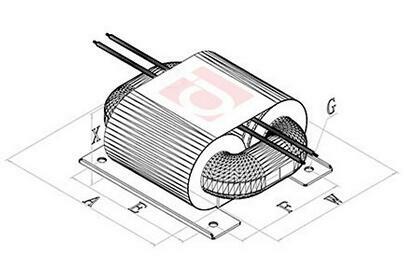 R Core used in the single phase or three phase transformer has high dielectric strength and lower noise. R core transformer is a new kind of dry type transformer. the magnetic core of R core transformer is made from continuous silicon steel strip, and the cross section is round, like O core transformer. R core transforer has the advantages of low noise, low flux leakage, low no-load current, low loss, and high efficiency. R core transforer is a kind of copper saving transformer, needs less copper for each turn. It has greater explosive power than toroidal transformer. The bobins of R core transformer are made of PBT plastic, which has a strong dielectric strength and fire resistance. R core transformer is widely used in industrial control, home appliances, hi-fi audio equipment, signal equipment, office device, communication apparatus, test instrument and medical instrument. Next news: Which Country did your cut to length machine export to?